"Coexistence with the Earth" as the theme. From a leasing company that emphasizes the usage of temporary materials, to a comprehensive and integrated consultancy company that goes by the theme of "Coexistence with the Earth". Hirose is making progress in the areas of innovation and evolution. 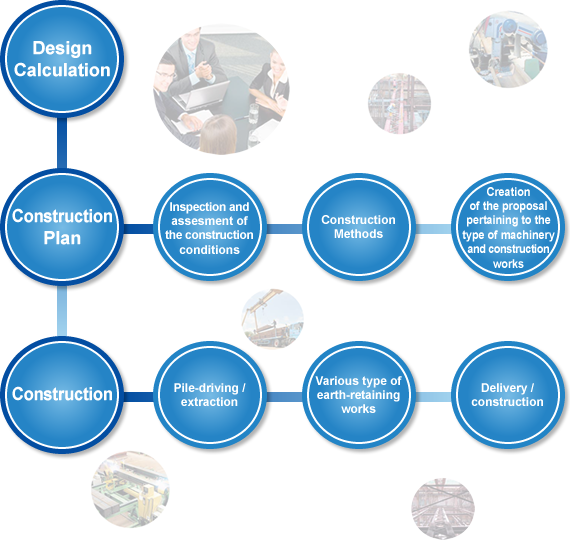 In the design and implementation of construction works, Hirose has, from the beginning, endeavored to provide the hard and soft aspects of civil engineering and construction foundation works through maximizing the full potential of the latest information technology, advance technical skills, unique construction methods and know-how, and networking. The building of infrastructure that forms the foundation of the human society is the core business of Hirose. The company's planning and design capabilities are demonstrated in the successful and on-time completion of big projects.